Voters’ Party International (VPI) chief Bharat Gandhi said that the scheme of giving Rs 500 to farmers and Rs 3,000 monthly to old labourers under the policy of universal basic income is bound to be succumbed by corruption. 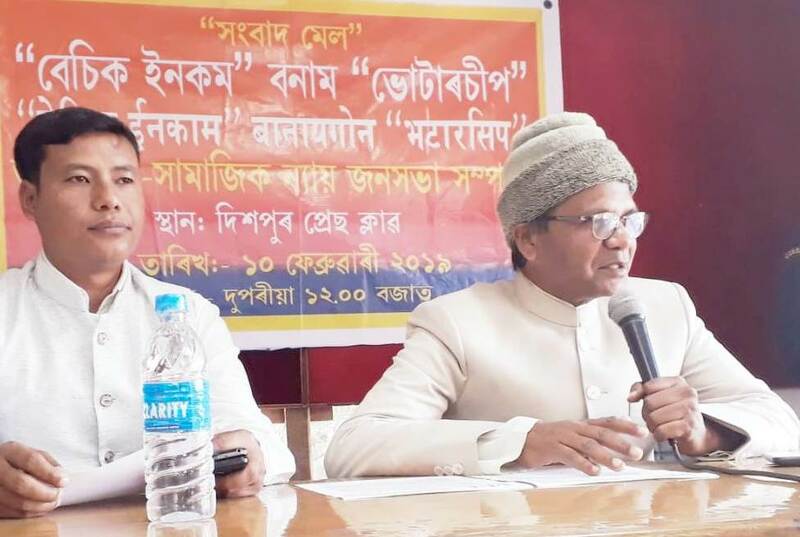 Addressing media persons at Dispur Press Club in Guwahati on Sunday, the VPI chief was of the view that the scheme of votership proposed by VPI is far better in comparison to universal basic income. He told that the UBI will be given on the basis of certificates issued by the government officials to farmers and old laborers. Gandhi observed that the said certificates will be issued only to those who will be selected on the basis of corrupt alliance of cadre of political parties and government functionaries. Consequently the access of targeted beneficiaries will be denied. On the contrary the right of votership, the 50 per cent cash amount of per capita voters’ income is proposed to distribute in the accounts of all voters who are out of the limit of income tax. He observed that the proposal of universal basic income is the kindness of the king on the ruled people. He said this is inadequate in the system of democracy, where the voters are masters in democracy. He said that Rs 500 or Rs 3000 is illogical and not serve any purpose. But he added that the amount of votership, which falls in the present prices Rs 6000 per month, is far better, democratic, rational and effective tool of inclusive growth and is corruption free. Explaining the idea of votership, the VPI chief said that this amount is similarly as dividend of companies to be distributed among the shareholders. He said that the state is also a cooperative company, the dividend of the company must be distributed among it’s share holders, who are called voters. He informed the media that this proposal was presented by more than hundred parliamentarians in the 14th Lok Sabha which is still pending for ratification. Gandhi said that on Tuesday, about 2,00,000 VPI workers will demonstrate for votership, the tool of economic freedom of voters.